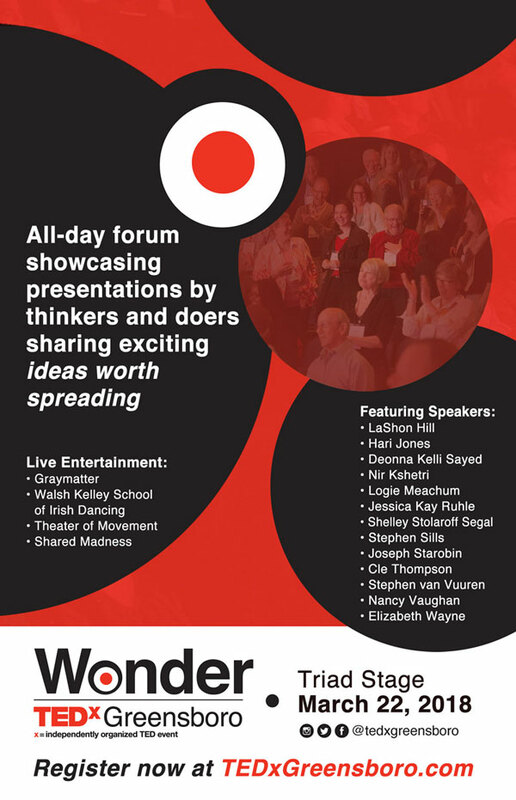 Magnetic Ideas is proud to be a sponsor of TEDxGreensboro for the 6th year in a row. Our founder, Jeff SanGeorge, is on the TEDxGreensboro planning committee, and Magnetic Ideas contributes to digital marketing strategy, social media, and more. We were able to use strong Wonder event branding by Shane Lucas from A Great Idea to help propel event promotion and event graphics. For more about how we have contributed to past events see our case study: TEDxGreensboro. The theme for this year is “Wonder,” celebrating the curiosity to explore what’s possible and the wonderment found in the unexpected. “Wonder” embodies the present, it carries with it feelings of surprise, curiosity, and sometimes doubt. It also provides a sense of marvel and amazement as we adventure into what’s possible. We live in a time where almost any idea can come to life, this is what Wonder is about. The March 22nd program includes topics from blockchain and crypto-currency to nanoscience, and ghost hunting. The event will include 12 live speakers as well as 4 live entertainers for a full day of new ideas and networking and fun. Similar to previous TEDxGreensboro events in the past, this time will be spent building and discussing new ideas. We are excited to continue to be a part of this great organization as we help to spread fantastic ideas worth sharing throughout Greensboro, NC and beyond.